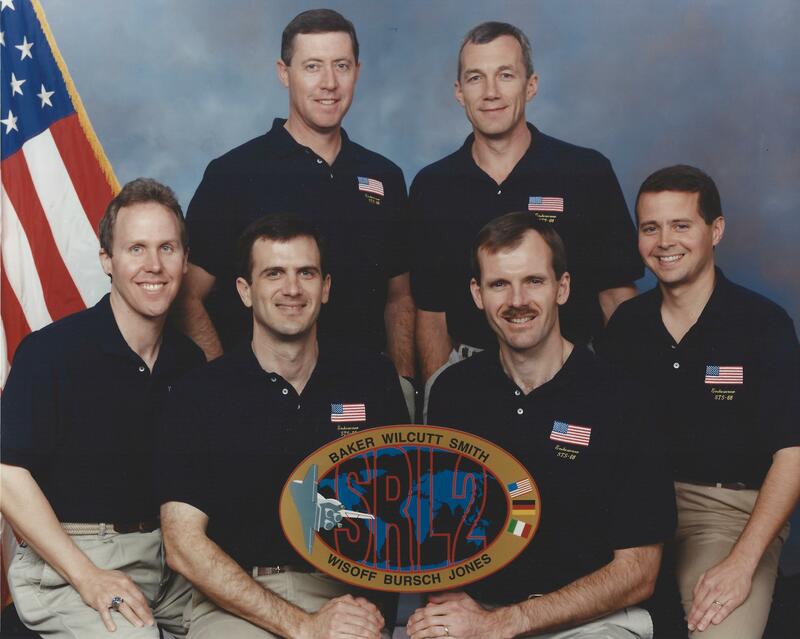 The crew of STS-68, Space Radar Lab 2, on Endeavour. Throughout our training syllabus, we were guided through the frantic schedule of classes and simulator sessions by our training team. Without their expertise, we would never have been ready in time for our planned Aug. 18 launch date. 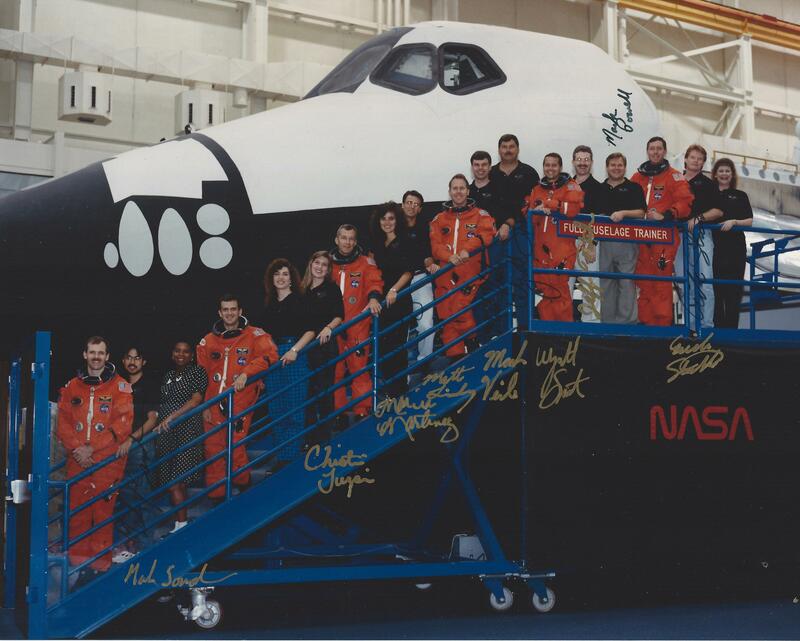 Our indispensable training team poses with our crew in front of the Full Fuselage Trainer at JSC in Houston. (s94-037719). The FFT trainer, once in Bldg. 9, is now at the Seattle Museum of Flight, still bearing the scuff marks from the boots of dozens of crews sliding down the exterior using their “Sky Genie” escape ropes. 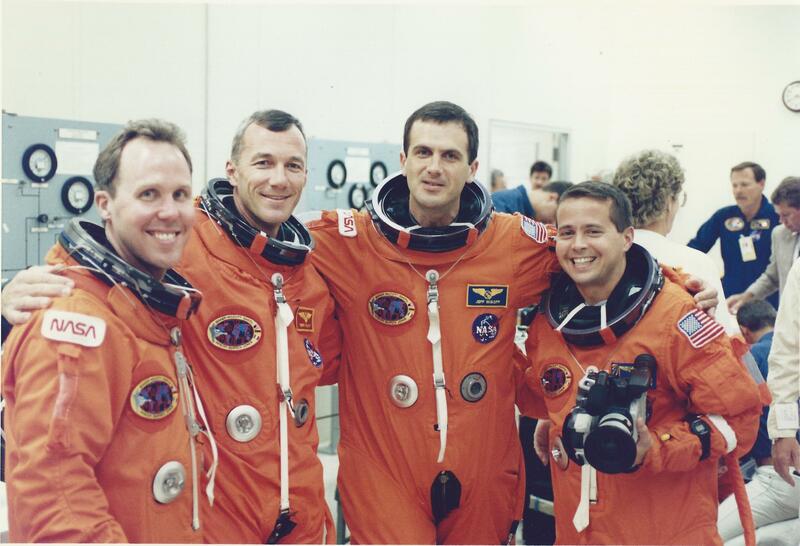 Our crew of six included two EVA-qualified astronauts: Jeff Wisoff and Steve Smith. 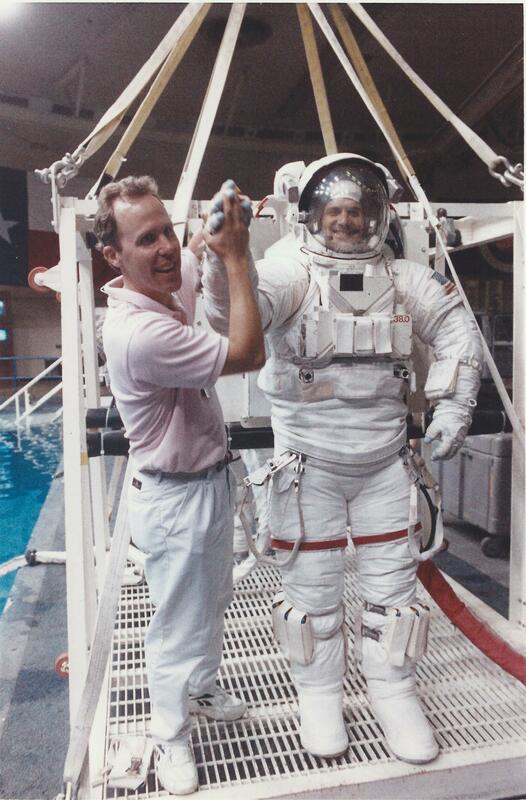 They trained for an unexpected spacewalk on STS-68, if needed for repairs or emergency closure of the payload bay doors or latches. As Jeff and Steve worked through their syllabus, including four underwater sessions covering most orbiter repair tasks, I visited to refresh my memory on their tools and to take some photos of them as they prepared to plunge into the 25-foot-deep pool. 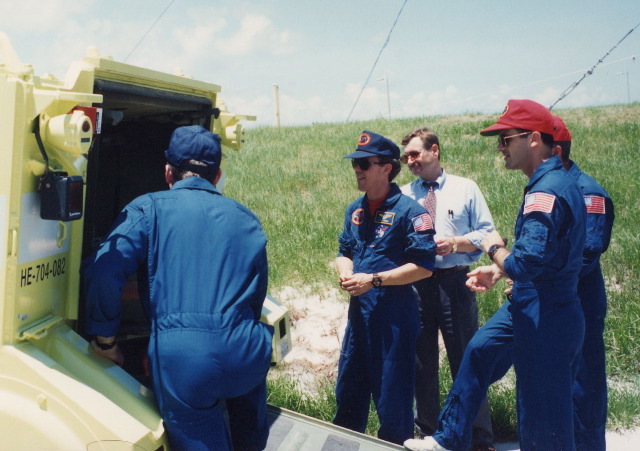 I’d trained for this same job on STS-59, a few months earlier. Here, Jeff is fully suited, on the donning stand, and ready to begin his training class. Steve Smith is on the other side of the stand. 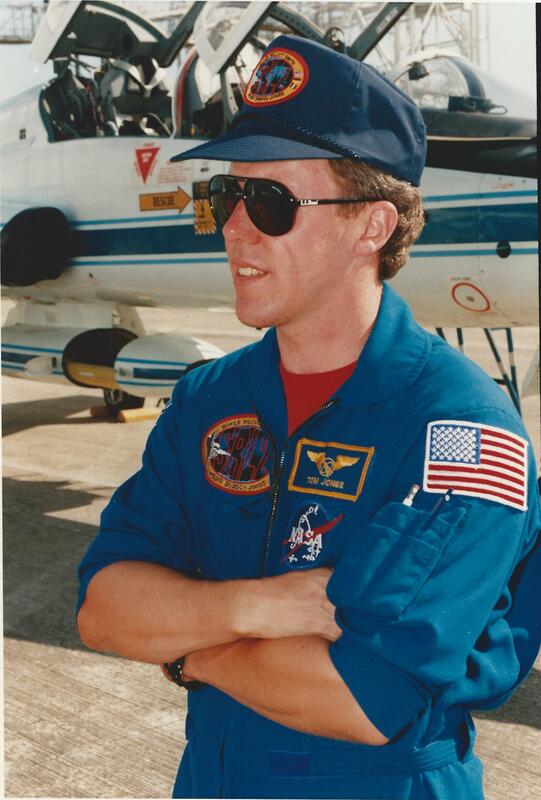 Crewmate and Endeavour pilot Terry Wilcutt took the photo. 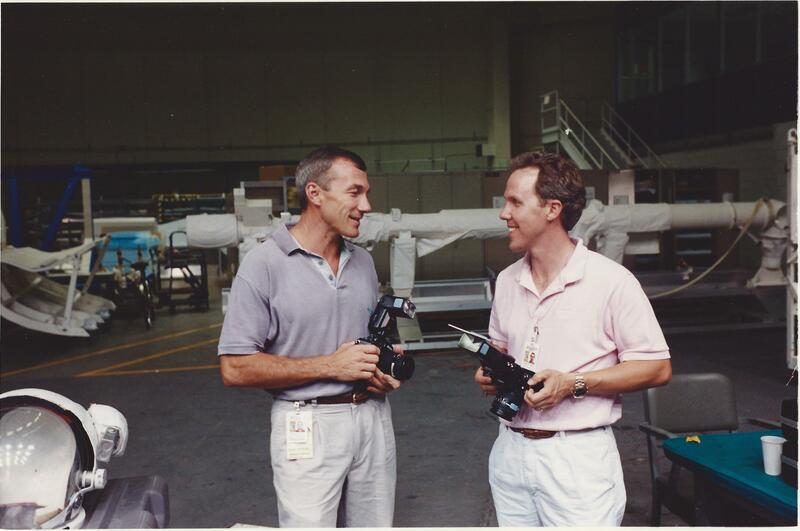 Terry and I discussed Steve and Jeff’s work poolside at the Weightless Environment Training Facility in Bldg. 29 at Johnson Space Center. This building had once housed the Apollo-era centrifuge, but with the advent of the shuttle, the centrifuge gave way to the new WETF swimming pool for EVA training. The building also housed control consoles, life support systems, tool storage, a medical office, and diver and astronaut locker facilities. An ambulance was always parked at the WETF entrance during suited runs underwater. We all had a chance to drive the M113 APC, below, just in case we had to evacuate an injured crewmember from the blast bunker and get him to a nearby helipad. 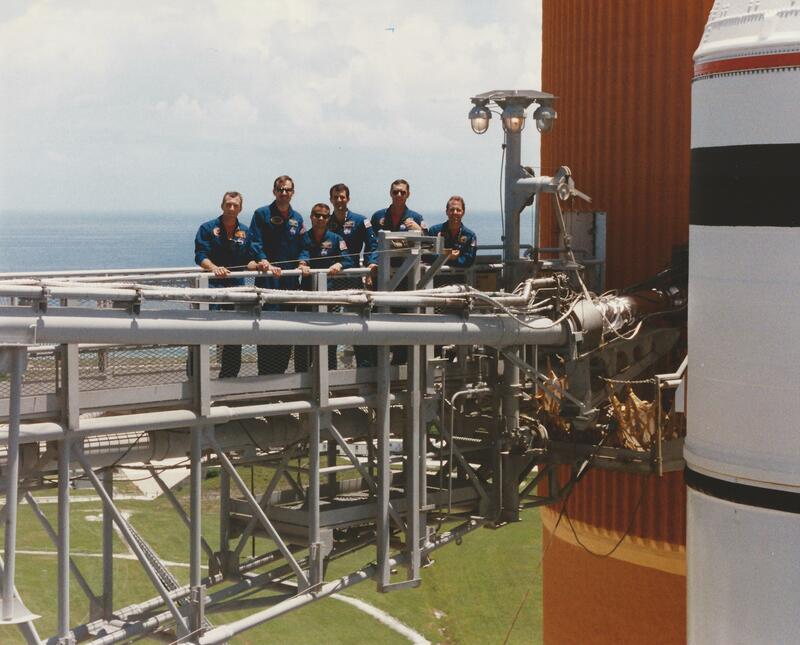 Our crew posed on the launch pad next to Endeavour during the Terminal Countdown Demonstration Test activities. This swingarm carries flammable, gaseous hydrogen away from the external tank during launch preparations. It’s amazing to get so close to this massive machinery, even more startling to realize you’re going to ride it off the planet. 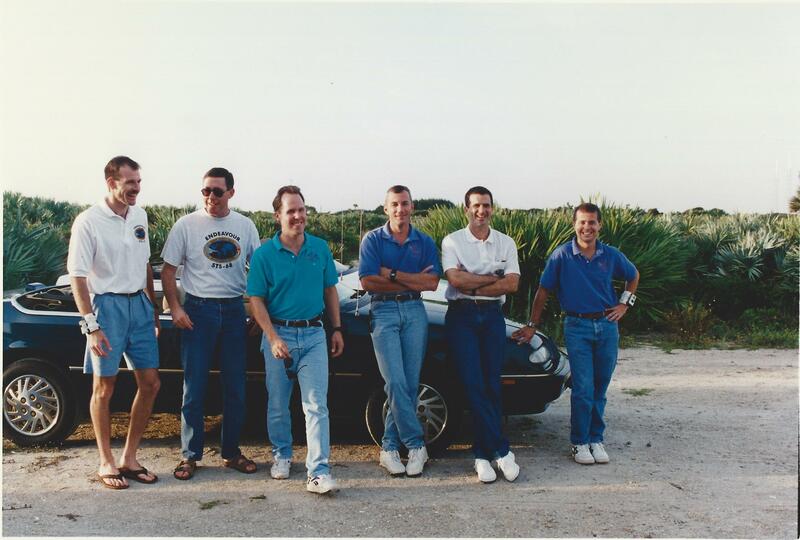 The STS-68 crew on the ET umbilical swing arm during TCDT, Aug. 1994. The AstroVan (below) is now on display near Atlantis at Kennedy Space Center Visitor Complex. Will it roll again? 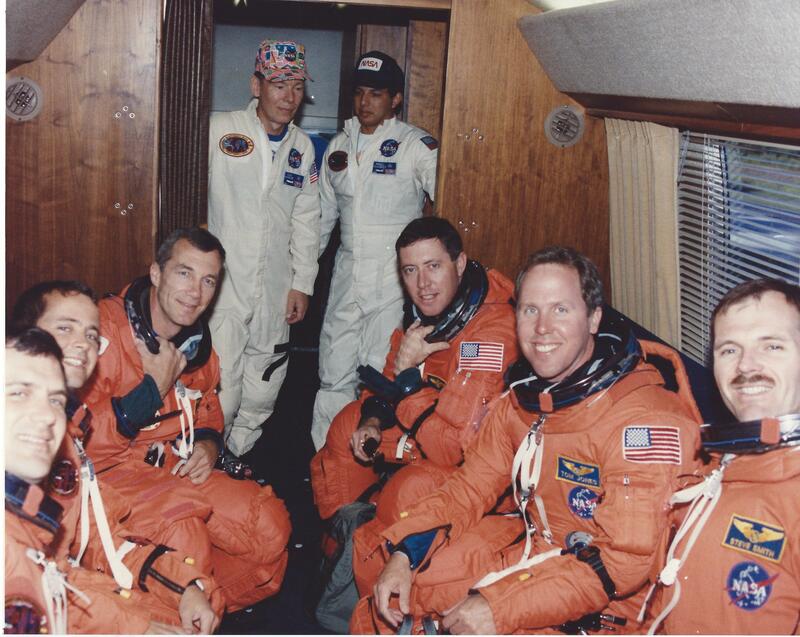 Here we’re loose and joking, but the atmosphere’s a little more tense on the day of the real ride to the launch pad. 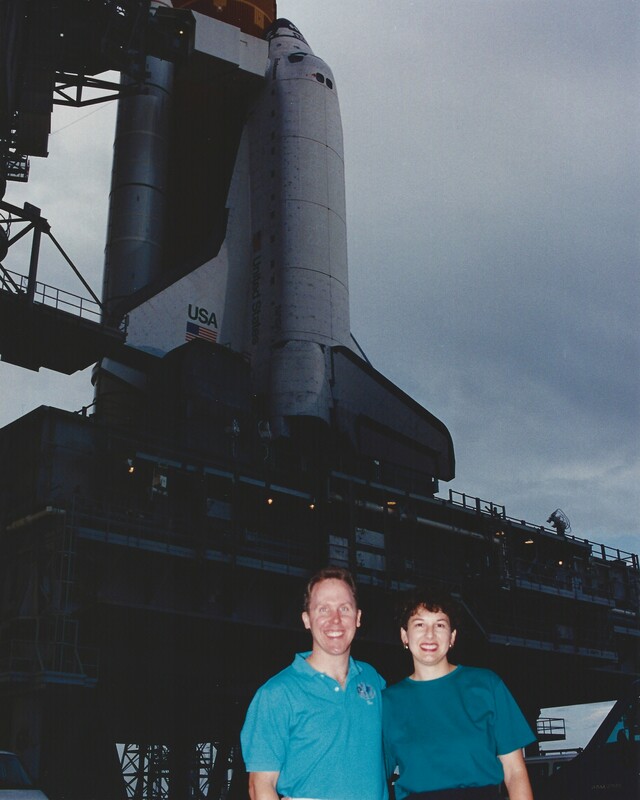 As we waited for our strap-in and countdown rehearsal aboard Endeavour, we took some photos atop the launch pad. 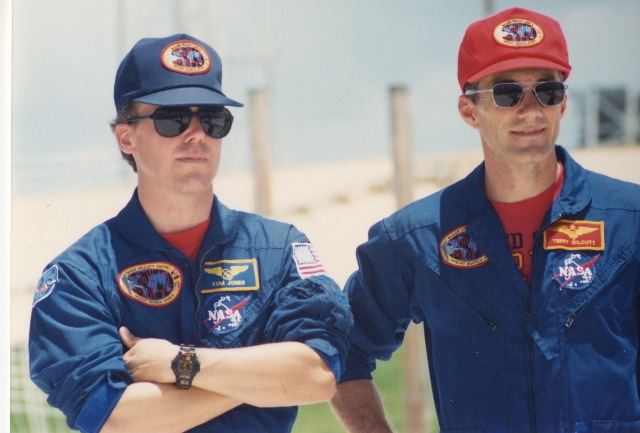 Steve and I would work on the Blue Shift together with Dan Bursch while in orbit. 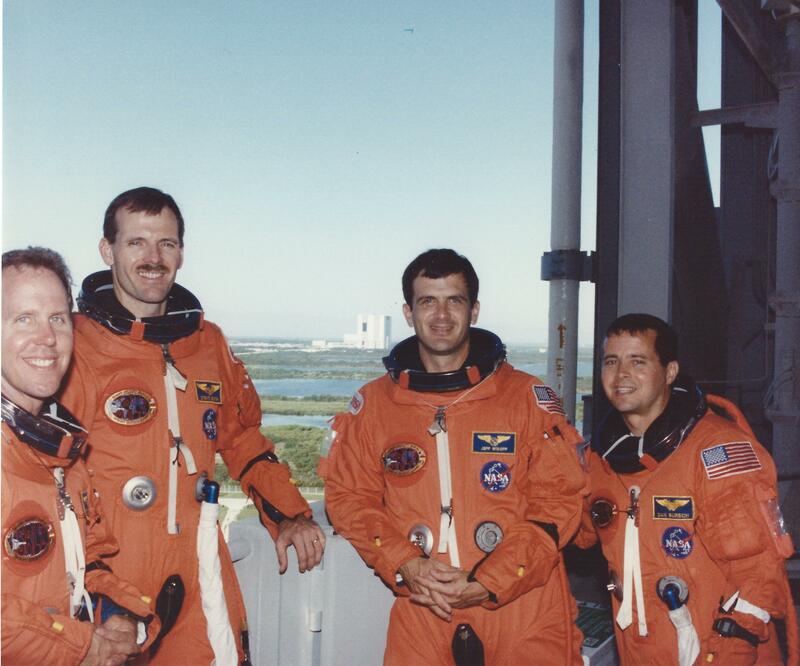 Steve rode uphill in the MS-1 position on the flight deck, next to flight engineer and MS-2 Dan Bursch. 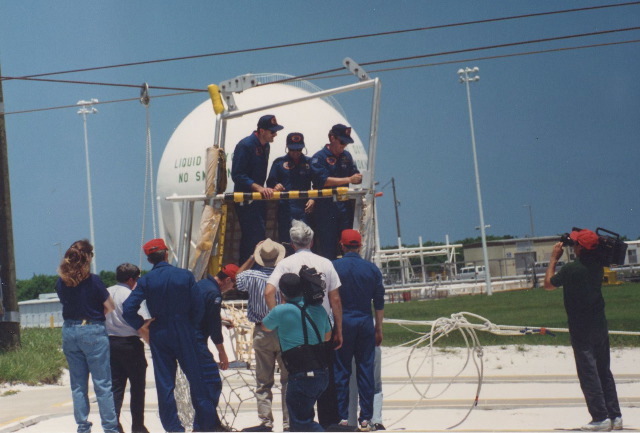 Our countdown rehearsal ended with a mock pad abort and an emergency egress from the crew module to the escape slide baskets on the western, or far side of the 195-foot level. Following lunch back at crew quarters, we headed back to the pad for an afternoon press conference near the blast bunker on the pad perimeter road. On the shot below, the slide wires for the escape baskets are visible, reaching back to the 195-foot level at Pad 39A. It was a hot August day on the Florida Space Coast. 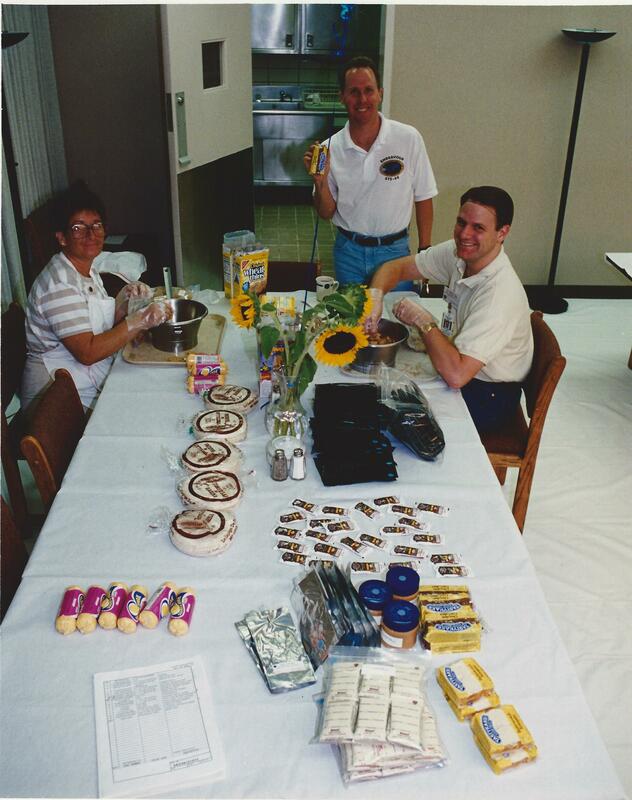 The day before launch, our food technicians start loading the contents of the fresh food locker: Wheat Thins in ziplocs, tortillas into dark green packages, squeezable cheese spread, picante sauce packets, peanut butter, empty water pouches, my TastyKake chocolate cupcakes and butterscotch krimpets, and (ahem) white packets of high-fiber cookies. 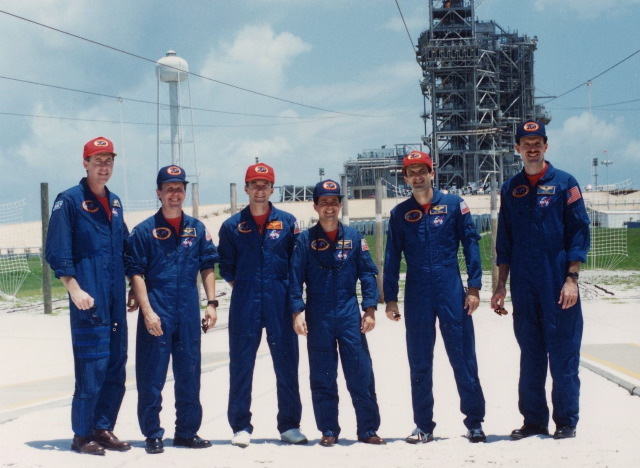 After our pad abort on August 18, we were all eager to go. 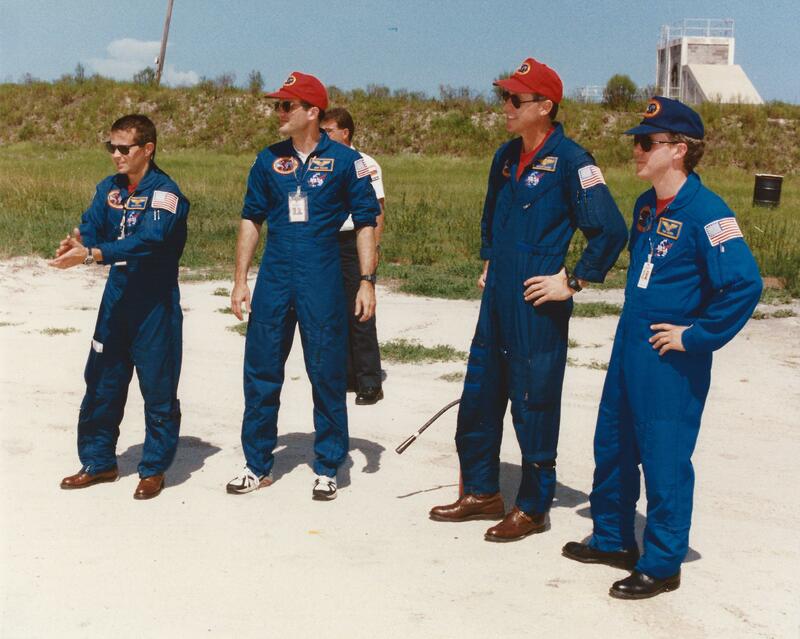 Here are the four “Hairballs” from the 1990 astronaut group flying on STS-68: Jones, Wilcutt, Wisoff, and Bursch. 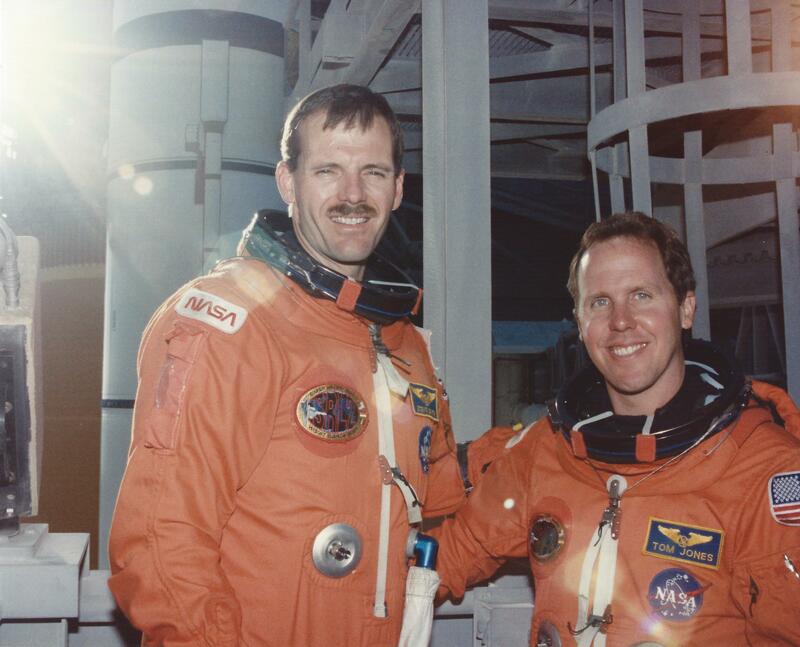 In the background of the suit room, we see Hoot Gibson (chief astronaut) in the blue flight suit, with tan-suited Dave Leestma (chief of Flight Crew Operations) on the right. We would shortly walk to the Astrovan for our ride to Pad 39A.